If I had to make a list of films that I’ve watched the most, somewhere at the top of that list would be Steven Soderbergh’s Ocean’s Eleven. I’ve watched it more times than I can count, and perhaps even more than likely culprits Star Wars and Lord of the Rings. It’s a heist movie, but imbued with a lot of humor, and driven by a large ensemble cast that is really the draw of the film. You come for the casinos and the hijinks, but you stay for George Clooney, Brad Pitt, et al. At first word of Ocean’s 8 being in development, I was an instant buy — opening weekend would see me in a theater watching what new capers there would be. I caught glimpses of the trailers and saw the plot description of the film revolving around a heist of jewels from the Met Gala. This called to mind distant memories of Ocean’s Twelve, a film I remember not enjoying (though several film blogs I follow have urged a reconsideration of the film). Even so, I held out hope, and sure enough as the end credits began to roll, a smile was plastered across my face and I walked out of the theater thoroughly entertained and looking forward to an Ocean’s 9. There are a lot of similarities to Ocean’s Eleven, beginning with Debbie Ocean (Sandra Bullock), Danny’s sister, appearing at a parole board hearing at the open. There’s a whole revenge subplot to the film (a la Danny v. Terry Benedict in Eleven), and lots of twists and turns, that while unique and deliver a wholly new experience, do seem to heavily rely on what came before in Soderbergh’s trilogy. A lot of the criticism about Ocean’s 8 that I’ve read has centered around this fact — that Ocean’s 8 isn’t daring enough and doesn’t try to branch out on its own. I do agree with this criticism and felt as if it left me wanting more, but I think you’ll find that doesn’t matter for the most part. As with Eleven (and Twelve and Thirteen), what really keeps you invested in Ocean’s 8 is really the ensemble cast, and boy did they do a great job finding this main crew. Each of the women seems to have a counterpart with the men from the original (Debbie/Danny, Lou/Rusty, Rihanna/Livingston Dell) but all of them bring new elements of their own and shine brightly as a group. Just starting with Debbie, her introduction is leaps and bounds ahead of our introduction to Danny Ocean. Instantly we see Debbie’s skills and conning and defrauding retail clerks, hotel concierges, and more. Gary Ross’s direction is pitch perfect and insta-hooked me into his take on this franchise. Ocean’s 8 doesn’t fully live up to Eleven, but to be fair, that is a high bar to meet in my head. My familiarity with Danny’s crew and the ins-and-outs (and what-have-yous) of the Bellagio job is hard to surpass. But it’s not necessary to “beat” my fond memories of Eleven, all I was looking for out of Ocean’s 8 was for it to be able to stand alone and call to me in its own way — give me a reason to want to rewatch it countless times. And boy did Ocean’s 8 deliver on that front. The introductions to Debbie and the crew completely blew me away, and the resolution of the Met Gala heist really tied things together in a neat little bow. The part that let me down the most was the middle chunk of the film; the nuts and bolts of the planning phase of the heist. I enjoy seeing the minute details and the behind-the-scenes assembly of exactly how this job will be pulled off (only to see how different it is actually executed later). It is this portion of the film that Ocean’s 8 diverges the most, focusing on characters rather than the planning, and left me wanting more. 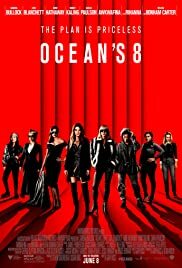 Ocean’s 8 was a blast to see in theaters, and while it delivered a tremendously good time, perhaps its best quality was igniting the “I really want to see an Ocean’s 9 movie now!” sentiment inside me. The opening of the film is on par, or even better than with Soderbergh’s films, and ditto for the end with the actual execution of the heist (the middle of the film, eh, not so much). The mainstream criticism that I’ve seen seems mostly on point in that, yes, it did a good job mirroring Ocean’s Eleven while introducing it’s own plot points, but I would really love to see Debbie, Lou, and all the rest of these powerful, resourceful, and crafty women truly branch out on their own. Gary Ross kinda pulled a The Force Awakens on us here by eliciting a lot of the feelings and memories we had about Ocean’s Eleven, and that’s fantastic. Now take that goodwill and make it your own; let us see what unique and interesting heists and cons these women can pull off without those same restrictions.